This entry was posted in Sophia Butler and tagged Chicago Defender, Civil Rights Movement, folk music, Langston Hughes, leadbelly by butler. Bookmark the permalink. YES. Awesome find, S. Langston Hughes is always worth reading closely (as you have), and I particularly like your use of bolded text to emphasize his insights. (One further thing to do would be to provide a full citation of his articles in your endnotes, even though you’ve helpfully linked to the articles. That way anyone reading this from beyond a campus might still be able to find the articles themselves.) 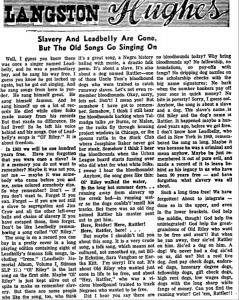 Hughes’s biting wit – “the old songs go singing on,” without the authentic bearers of the slave music tradition actually around to sing them – raises one of the key issues for us in this class. Who has the right to sing this music? Who has the responsibility to sing it? There’s a felicitous intersection between your post and BC’s, on the role music played during the protests in Selma, Alabama 50 years ago. 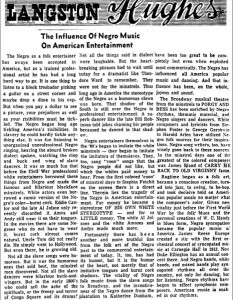 Almost as if heeding Hughes’s call, the protesters sang spirituals and folk songs – evoking the oppression that fueled their own protest movement while also reclaiming that music from mass culture, whose reach and exploitative tendencies Hughes decried. It’s almost as if the Selma protesters answered Hughes’s question, “No, we have not forgotten.” And they answered in song.